Each girl, at least, once in her lifetime, dreams about walking the ramp as a fashion model. Have you ever thought what prevents you from being one? Well, there are two basic things to be model, unique facial features, and flawless skin. Wrinkles you cannot expect at the early age but pimples and blackhead bother almost every girl. Blackheads are nothing but skinless pimples, however, treating blackhead is a bit more complex than pimples. There are many claimants, from local drug maker to international brands, who claim to have an elixir against blackheads, but finding a permanent solution to blackhead is a challenge. 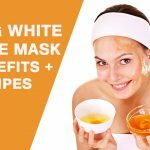 Here are some effective homemade blackhead removal mask have a look! The answer lies in your skin type rather than A or B mask. The beauty bazaar is filled with endless types of marks for blackheads. Therefore, zeroing down is a difficult task. However, based on your skin type, if you can find the right blackhead mask, it can surely leave your skin pampered, exfoliated as well as blackhead free. 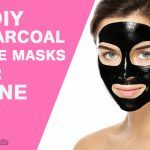 However, the ideal option is to prepare a homemade blackhead mask that can suit your skin perfectly, cleans pores accurately, and Nourish the skin to avoid blackheads in the future. Going natural has its own benefits; hence, getting blackhead mask at home ought to be your aim. The homemade blackhead masks appropriate your skin, complements well, and helps in preventing the reappearance of the blackheads. Baking soda does not only exfoliate the skin but also helps balance skin’s pH. Resultantly, your skin produces less oil while it keeps your pores unclogged and skin absolutely clean. Preparation Time: 1 minute for preparation, 5 minutes on the face. In a bowl, mix baking soda with a water to prepare a paste. Apply the paste gently on your face; especially around blackheads. Massage the nearby areas with gentle pressure if the fingers. Let paste stay on your face until it dries up. Apply a little apple cider vinegar as a toner to attain the natural pH level. How it works: Baking soda contains no harsh chemical formation and has gentler abrasive elements that not only clean the pores, but exfoliate the skin, open pores, and remove dead cells leaving skin replenished and soft. Splash your face before applying the paste to smoothen the skin and open the pores. Stop using baking soda if your skin finds it irritating, you might be allergic to baking soda. Preparation Time: 2 to 5 minutes. Add 2 tbsp. of Gelatin to 3 to 4 tbsp. of water. Combine Charcoal powder to the mixture. 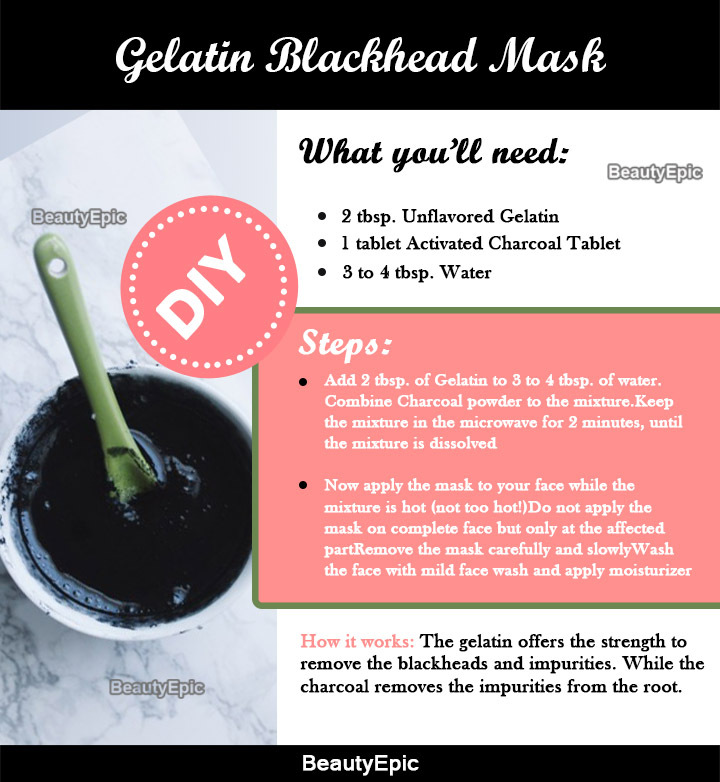 How it works: The gelatin offers the strength to remove the blackheads and impurities. While the charcoal removes the impurities from the root. Tips: The removal may be hard and a little bit painful, therefore, remove the mask while fingers on your face and remove the mask with another hand. Honey is a natural antibiotic, which acts as a cleansing agent for skin when applied. 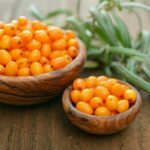 It also keeps skin hydrated to ensure excessive oil can be absorbed quickly. Besides, honey has antiseptic and elements. Preparation Time: 15 minutes on the face. Pour 1 tsp honey into the bowl. Wash face with the warm water as honey thickens on the skin. Wash face with cold water and apply regular face cream. Honey’ antibiotic properties are known to drag the dirt out of pores and cleanse it thoroughly. 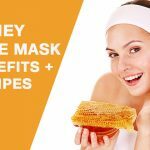 Honey pulls the blackhead out and soothes the skin with anti-inflammatory properties. Best time to apply: Anytime in the day. Look for dryness while applying honey as it thickens on the skin. Avoid mixing lemon if you have a problem with bleaching elements. Use only pure honey, as the market is filled with adulterated honey. The gelatin and milk are natural ingredients to remove impurities. Gelatin contains vitamins and minerals that nourish the skin, while antioxidants exfoliate and supple the skin. Preparation Time: 15 minutes for preparation, 40 minutes on face. Pour 1 tsp of gelatin into a microwave bowl and add 2 tsp milk. Mix the ingredients until the paste becomes thick. For nearly 15 seconds, microwave the paste before applying. Clean your face with warm water before applying the mask. Apply the mask on your face with paying more attention to the blackhead areas. Keep the mask on the face for 40 minutes, until it gets completely dry. Start peeling the mask off from edges and go inward. Apply regular face cream instead of washing the face. Gelatin, with its vitamins, known to the firm, clean, and hydrate the skin. At the same time, milk helps neutralize the pH balance and promotes cell generation. Both together removes the impurities and reduces the excess flow of oil. Best time to apply: In a free time at night. Peel the mask carefully. Sensitive skin may find peeling a bit more painful. In order to check the hotness, dip the finger in the paste after removing from microwave. Do not apply the mask too close to eyes. Try to apply thin layer instead of thick one. The more natural mask you use, the better your skin reacts and the risk of any side effects is lesser. The egg whites are rich in protein. Besides helping to get rid of blackheads, it helps you rid of discoloration that is caused due to acne. 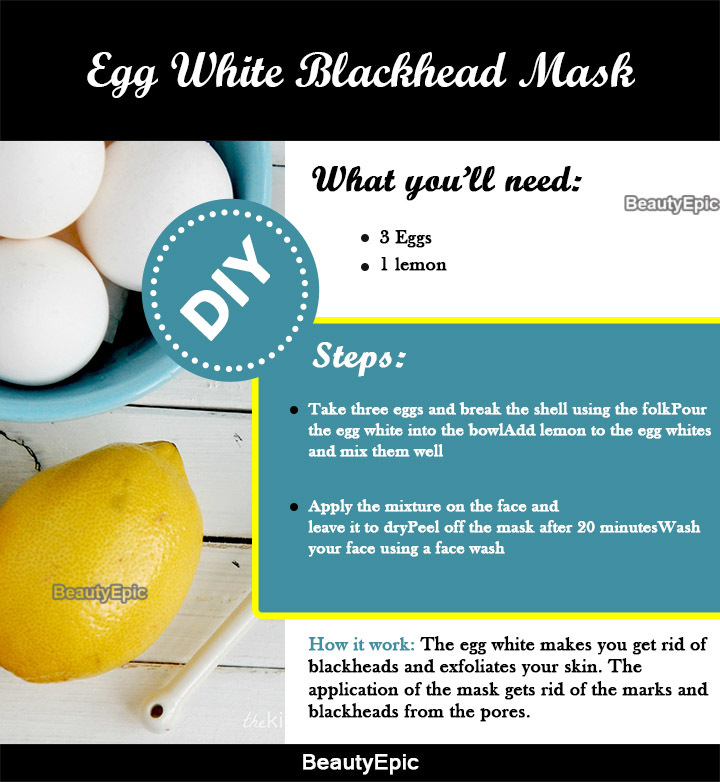 How it work: The egg white makes you get rid of blackheads and exfoliates your skin. The application of the mask gets rid of the marks and blackheads from the pores. Best time to apply: Any free time during the day. Tips: Do not use anything other than the eggshells. Dermatologists caution against using glue for blackheads and warn of damage to the skin. However, the result is very from skin type to skin type. In case if you have hydrated skin, peeling glue may not be much pain. Preparation Time: 15 to 20 minutes on face. Apply warm and wet towel for a couple of minutes before applying the glue. Glue is basically an adhesive which is made of chemicals. If firms on the skin once you apply and acts exactly like waxing strips to extract blackheads from your skin. Those who have tried glue would suggest using only if you have deeply rooted blackheads as it may cause skin irritation. Repetitions: Only when you fail to rid of using other home remedies. Best time to apply: Any time during the day. Skin specialists suggest not to use glue unless necessary. Avoid glue if you have a hypersensitive skin. Apply glue on the back of your skin for testing before applying on face. Visit dermatologist in case of severe skin irritation. Never thought a teeth cleaning and whitening product would be used on your face? Well, toothpaste is one of the most common products advised by the DIY experts. However, the doctors never recommend it. One of the main reasons being, toothpaste have ingredients that make your skin excessively dry and sometimes the bleaching might burn your skin. How it works: The toothpaste will help to get rid of the blackheads from the pores. The ingredients in toothpaste help get rid of blackheads. Repetitions: Once a day or every alternate day. Remember to use only white paste and not gel toothpaste. Do not apply the toothpaste if it leaves patches or causes burning sensation. Blackheads are as good as pimples and can cause a major embarrassment. For all damsels around, the major concern has always been hiding blackheads using concealers and makeup foundations. The reason being that these beauties are scared of using chemical driven beauty products to remove the blackheads. 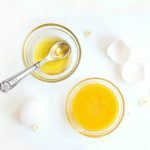 Therefore, we have covered home remedies with ingredients you use in your daily life without knowing that they have beauty benefits too. So, let us know your favorite DIY blackheads removal mask from aforementioned tricks and let us know your beauty secret. 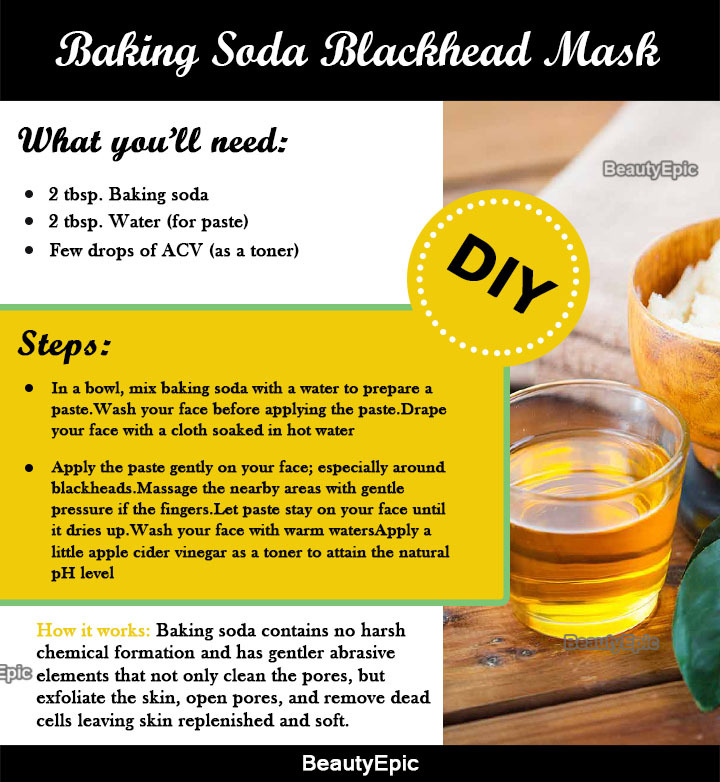 The homemade blackhead masks appropriate your skin, complements well. 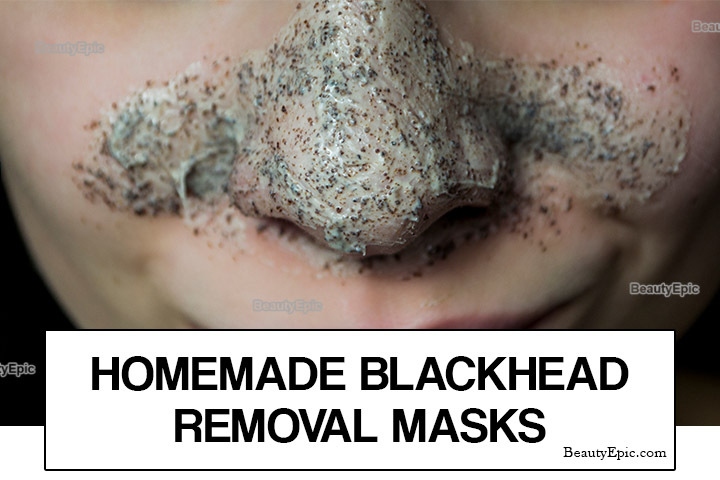 Here are some effective homemade blackhead removal mask recipes have a look!